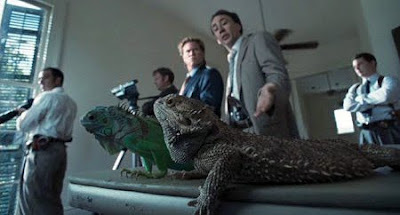 Originally reviewed here at the time of its theatrical release, Werner Herzog's Bad Lieutenant: Port of Call New Orleans is now out on Blu-ray and DVD. The film is a testament to the skewed sensibilities of its director and star who here seem to strike a level of attunement which had been missing in Herzog's narrative films since his last collaboration with Klaus Kinski. Some of the credit should go to Nicolas Cage, who manically apes Kinski to some extent, twisted in pain and hunchbacked like the German actor's character in For a Few Dollars More (1967). A lot of it goes to Herzog though, for unflinchingly tailoring the operatic film to fit loosely around Cage's outsized performance. Post-Katrina New Orleans is an appropriately grimy, corrupt setting to explore Cage's Terence McDonagh. Herzog uses the swampy, quirky locale to mirror McDonagh, a sinful man with moments of angelic beauty often revealed in his dark-circled, pale blue eyes. McDonagh stands in stark contrast to the earthier, and earthbound, characters he runs across. Big Fate (Alvin "Xzibit" Joiner) is the local drug dealer he falls in with during a murder investigation, using him both to get answers and sate his appetite for narcotics. Partner Stevie Pruit (Val Kilmer) is a mean cop, taking pleasure in the evil he perpetrates, an immoralithy which McDonagh more likely feels he can't escape. Allowed by Herzog to frolic unfettered through this decadent film, Cage scores with a joie de vivre long absent from his movies. He is less a misguided good guy gone wrong than a wicked man afflicted with pangs of conscience; a dirty cop punished with prescription drug addiction after a back injury acquired during the commission of a moral act—saving a man locked in a cell slowly flooding during the hurricane. Cage vacillates between the literal pain it takes to do good and the joy of indulging his baser instincts with his usual grand histrionics. In one scene, his glee regarding Big Fate's murder of a mutual enemy is only surpassed by his astonishment at seeing the dead man's soul breakdancing during a drug-induced reverie. Yes, this gonzo cop flick is just on the edge of earning the "camp" designation. The iguana hallucination scene pictured above just about puts it in that league. But it would be more accurate to categorize it amongst the long list of neo-noir-inflected, exploitation, grindhouse potboilers which once garnered cult audiences, and have all but disappeared. Bad Lieutenant: Port of Call New Orleans fits well into that tradition and is probably one of the most unexpectedly enjoyable movies I've seen in the last year. I watched it this weekend, and I really liked it a lot. I thought Cage was about as good as he's ever been, but what the hell was that odd, nasally voice he switched to at about the midway point, only to switch back again by the end? I'm not sure about that choice, but that's a small gripe. It was otherwise wonderfully entertaining and idiosyncratic, and who ever thought Herzog would make a film like this? What a terrifically bizarre career he's had so far. I really want to see his follow-up, MY SON, MY SON, WHAT HAVE YE DONE (starring another bizarro-actor, Michael Shannon), to see if Herzog can sustain the idiosyncracy you suggest in a subsequent film. While I still feel like Herzog intentionally made this film as inaccessible as he could, Cage's performance really sold the package for me. Surely the OTT-ness and style is the whole point Japan Cinema but fair enough if that just isn't for you. What is happening with the distrubution for that second 2009 Herzog film?